Lets ‘do’ Christmas, Clachaig style. 2 nights Bed & Breakfast, 2 nights of live ceilidh music & a Hog Roast. 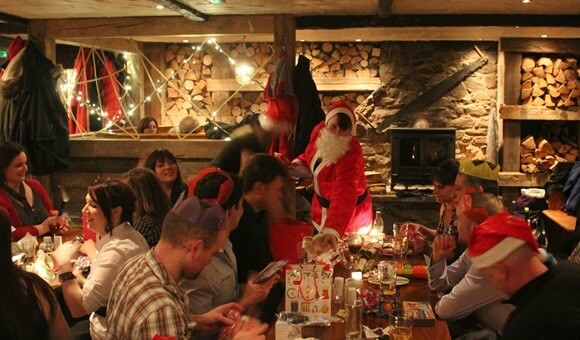 It’s no secret that the Christmas Party Night is our favourite event of the year. It’s work, but not as we know it. Whilst the atmosphere at Clachaig on a Saturday night is legendary, our Christmas Party Night goes one better. It’s a simple but effective formula. 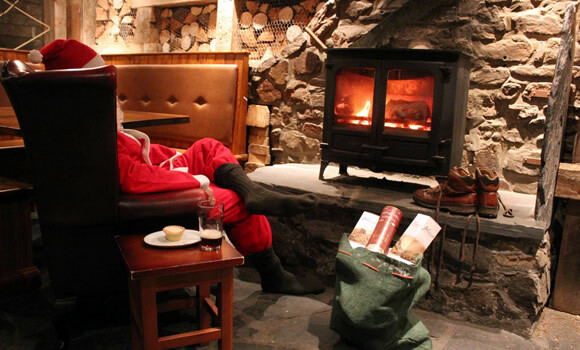 Take one Boots Bar with roaring log fires, a glass of mulled whisky cask cider as you arrive in the bar, add a Christmas meal based around a hog roast (slow cooked on a spit in the bar), some convivial chat with your fellow party-goers, a visit from the Big Fella in the red suit himself (be sure that you don’t make it on to Santa’s naughty list! ), and some live music from the Highland Fire Ceilidh Band to finish. Then on the Saturday we have more live music from the Riska Ceilidh Band. Make sure you bring your dancing shoes for a weekend of Ceilidh dancing. Don’t worry if you don’t know the moves nobody really does anyway but the bands will be able to talk you through the steps. See the details of the party on our Whats On page. Includes our usual bed and breakfast on the night of Friday 13th and Saturday 14th December 2019, price assumes 2 people sharing a twin or double room. Single supplements may well apply. Friday night after the Hog Roast the Highland Fire Ceilidh Band (you may also know them as hò-rò) will get you up on your feet to help dance of that Hog Roast. Then on Saturday night we have local band the Riska Ceilidh Band closing out the weekends fun with some more ceilidh dancing and few modern covers. Offers are strictly subject to availability. This offer is not available with Clachaig vouchers.